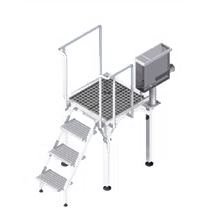 The stable working platform is designed and constructed with priority to convenience and safety. Possibility to fit on the platform a washbasin or a sterilizer on a special base. It is used in order to adjust slaughter’s height with the suspended rail. Variable dimensions, depends on customer’s desire, where the platform will be installed and the working positions. The main construction remains the same at any dimension. The frame and the protective bar are made of stainless steel and the ground is made of a special no-slide, hot-galvanized rack.